LONDON . . Pub .. I'm guzzling warm ale in a pub. Drawing helps me notice details. 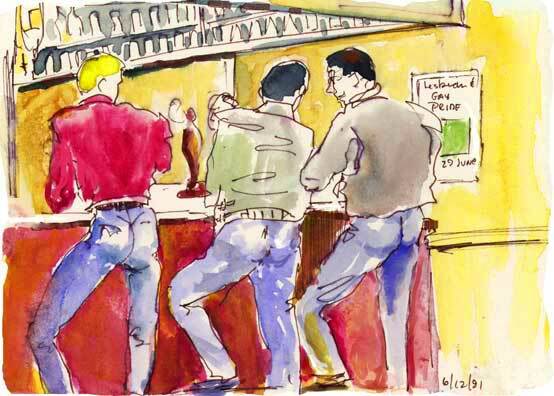 For example, drawing these men in tight jeans, and the poster, I notice this is a gay bar. I'm saddened by a young Basque named Carlos, who laments: "I was a shepherd, tending sheep happily in the mountains. One day they found me in the hut with mi amorado. My family ran me out. l can never go home. I hate it here, alone."